Fishing boats docked in the tranquil waters of sleepy Snug Cove in Eden. It sounds like fiction, but the special relationship between whalers and orcas in Eden is more than the stuff of local legend, writes Jennifer Ennion. 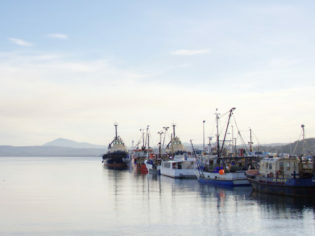 A ragtag group of fishing boats reflects in the glassy water of Snug Cove. A few seagulls hop about the harbour’s edge, while even fewer tourists take advantage of this calm autumn day. A small commercial fishing fleet is in port; the captains waiting for a strong southerly to hit and then promptly pass so they can return to sea. It’s a peaceful introduction to Eden and a far cry from the days when whaling fever gripped the town. Then, in the mid-19th century, men were known to leave half empty beers on the pub countertop and children would skip school, racing to watch Eden’s hardy whalers row furiously into Twofold Bay. It would be all hands on deck as rival whaling companies fought to claim their prize – a humpback on its annual migration to or from Antarctica. Spot humpbacks from May to November along NSW’s Killer Whale Trail. When a chase was on, Eden came to a standstill, for townsfolk knew whaling here was unique. This is where a pod of killer whales hunted with the whalers. As legend has it, the orcas would harass passing humpbacks and corral them into Twofold Bay. With frenzied tail slaps, they would signal to Eden’s shore-based whalers, who would rush into small wooden boats and row to the action, despite the danger. The whale went to the first boatsmen who harpooned it, unless the creature broke free, and then the battle would resume. After what could be an hours-long assault, the whale would meet its end, and the orcas would feast on its lips and tongue. A day or so later, the carcass would float to the surface and the whalers would tow it to the tryworks where it would be harvested for oil and bone. It’s a gruesome history, yet one that locals proudly tell. And it’s their story that attracts tourists to Eden today. When I first arrive at sleepy Snug Cove, it’s difficult to imagine the drama of this fishing village in its whaling heyday (1828–1930). But you only need to glance around to realise the deep-rooted connection locals still have with salt and sea. Cafes are seafood-centric, whale-watching tours are available, and the Eden Killer Whale Museum is a main attraction, along with the Killer Whale Trail. It’s the latter that has drawn me here. A whale chase c1910, showing George Davidson with harpoon in hand and Old Tom alongside. Eden, NSW. Although the whalers are long gone, they are far from forgotten along the trail – a self-drive route of important whale attractions. One of those is Davidson Whaling Station, an historic homestead and tryworks in Ben Boyd National Park, 10 minutes south of Eden. Davidson Whaling Station was the home of Eden’s most prominent whaling family, and was Australia’s longest operating shore-based whaling station. For more than three generations, the Davidsons hunted whales and brought them to the shores of Kiah Inlet for processing. Despite its somewhat tragic role, nowadays the station is beautiful in its isolation, surrounded by forest, at the end of a dirt road. George Davidson, the last of the Davidson whalers, was among a small group of Eden locals who witnessed the end of the town’s whaling industry, with the death of Old Tom, the leader of the orca pack. Old Tom was found washed into Snug Cove on 17 September, 1930. To honour his significant role, residents decided to keep his skeleton, and it’s now on display at the Eden Killer Whale Museum. To outsiders, orcas and humans hunting together sounds like the stuff of fairytales, but the museum’s secretary, Jenny Drenkhahn, says it was an incredible relationship. Eden’s history, she says, is part of the locals’ ethos and features strongly in the education of the shire’s children. “It’s just part of their being that this amazing story happened,” she says. Although it can never be known for certain whether the orcas were in fact hunting with the whalers, or if it was simply a coincidence, local indigenous clans firmly believe they communicated with the whales. Legends tell of indigenous chiefs singing on the shores of Twofold Bay, calling out to the orcas that they were hungry. In response, the orcas would push humpbacks onto the beach, where warriors lay in wait to attack. As a result, the orcas were held in high esteem. “They believed the orcas were reincarnations of their elders because they were bringing food to them,” explains Jenny. In his book, Killers of Eden (1961), Sydney journalist Tom Mead instead writes that the ‘team’ of killer whales were as invaluable to the whalers ‘as a pack of trained dogs to a drover’. And perhaps the relationship was based on training more so than anything else. It’s a mystery I ponder back in Snug Cove, where the predicted southerly rushes in across the bay. The wind knocks about the handful of fishing vessels tethered to the timber wharf. The sky turns dark, storm clouds loom large, and there’s a quick drop in temperature. All of a sudden, it’s easy to imagine the drama that unfolded here when Eden’s whalers gave chase. A frenzied wharf precinct, with exhausted, weather-beaten men rowing back to shore with the day’s catch. Sea and salt embedded in the community. Eden is 260 kilometres from Canberra on the Monaro and Princes highways on the NSW South Coast. The closest airport is Merimbula (20 minutes north), serviced by Rex. The road into the national park is sealed and the historic sites are well signposted. A timber boardwalk leads to Ben Boyd’s Tower. A great time to visit is during the annual Eden Whale Festival, 29–30 October, with a parade, markets, marine presentations and live music. Seahorse Inn – A boutique hotel located on the gentle shores of Twofold Bay, at Boydtown, seven kilometres south of Eden. Ask for the spacious spa suite with bay views. From $297 in the off-season (March and May to Aug). On the edge of a peninsula, staring out to sea, is Green Cape Lightstation in Ben Boyd National Park. With stunning views across Disaster Bay, the lightstation is a great place to whale watch. Boyd’s Tower became a whale lookout for prominent businessman Ben Boyd. Today, the sandstone tower is a beautiful relic, standing among a forest of twisted tea trees. If you don’t want to venture out of town, head to Eden’s Rotary Lookout, on the hill past Snug Cove. From here, you’ll have views across the southern section of Twofold Bay.